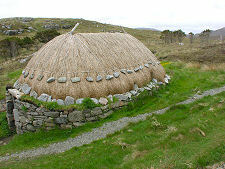 As you pass along the A858 in Western Lewis near the township of Shawbost (Siabost) watch out for a brown tourist sign pointing west towards a Norse Mill. 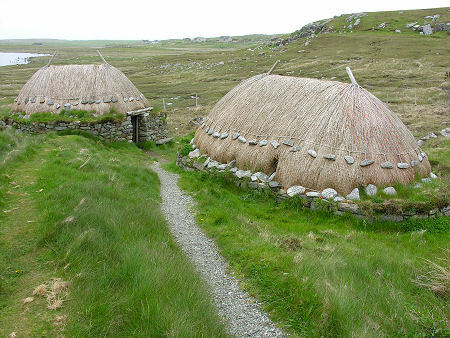 From the small car park, a well made path leads for a quarter of a mile to two traditionally constructed and thatched stone buildings set into a small river valley. Lewis was once home to as many as 200 small horizontal wheel mills. 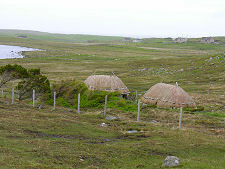 What is variously know as Shawbost Mill or the Mill of the Blacksmiths remained active until the 1930s, though the last still operational in Lewis only stopped turning in 1945. Shawbost Mill was first restored in the late 1960s, but the current restoration dates back to 1995. 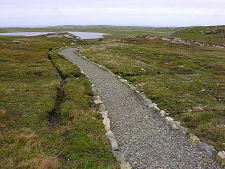 The high quality path was added in 2003. The building you see on your right as you approach is the kiln. 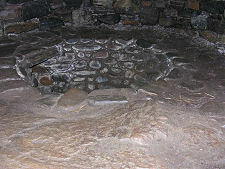 It isn't immediately obvious how this worked, but half the floor area comprises a raised stone platform within which is set a circular stone-lined pit. This presumably contained the fire that heated and dried the grain spread out around the remainder of the kiln. 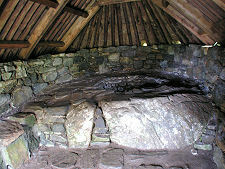 The mill is more immediately spectacular, though here much of the workings are set in a chamber below floor level. Water from the nearby burn was led into a mill lade some way upstream from the mill. It was then channelled to the top of a mill race just behind the mill itself. From here a steep chute directed it down onto one side of a circular set of paddles, set horizontally in a chamber directly beneath the mill. The water turned the paddles, which caused the upper of the two millstones in the mill itself to turn, which in turn ground the grain. 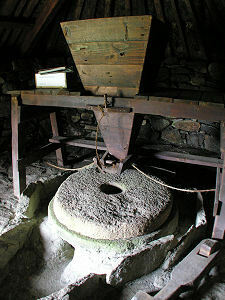 Part of the mechanism joggled the wooden hopper located above the millstones, which ensured the flow of grain into hole in the centre of the stones. The flour which was produced was gathered by the kerb stones around the lower millstone and gathered in front of it. 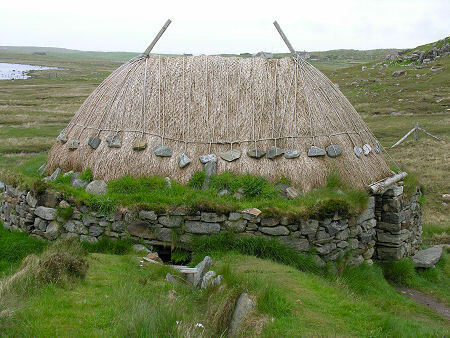 Shawbost Mill is not the largest or best known of Lewis's visitor attractions, but a visit does provide a fascinating insight into away of life once very common on the island.